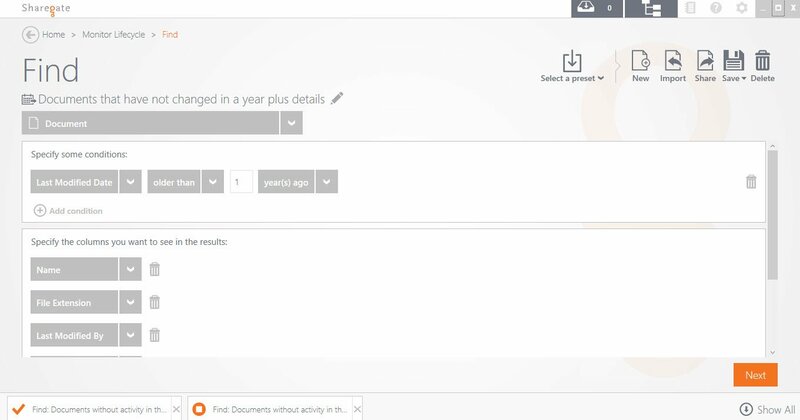 We all reach this moment at one point or another in our life as SharePoint Admins: you fire up your SharePoint to find a document, and and then come to the realization that your content is a mess. Your users blindly uploaded files to random libraries, regardless of their extension, size and other characteristics. They've ended up losing track of where their content is located and probably even forgot that the files even existed. 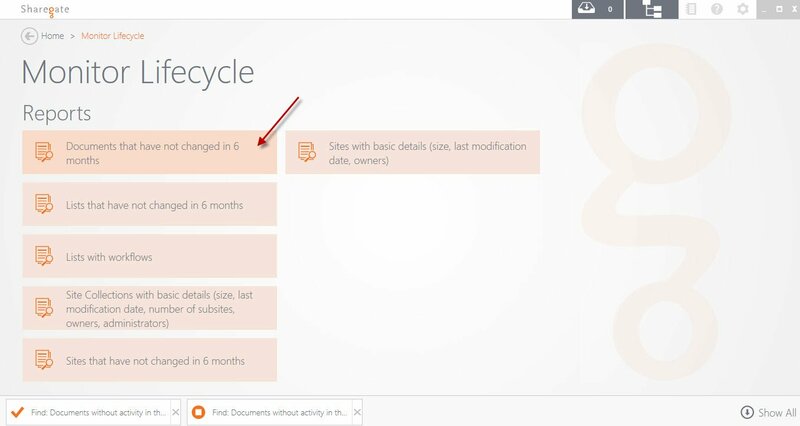 There has to be an easier way to manage all your content as the SharePoint user base grows! Since your SharePoint libraries can get messed up pretty fast, how can you keep track on this mess in order to clean it? A good way to do so would be by gathering more details on all of those documents. That way, you can better determine if you should rather archive them, migrate them to another location (learn how to quickly do it with Sharegate here), or basically wipe those files off. Sharegate can greatly help you gather all the details you need within a few seconds. 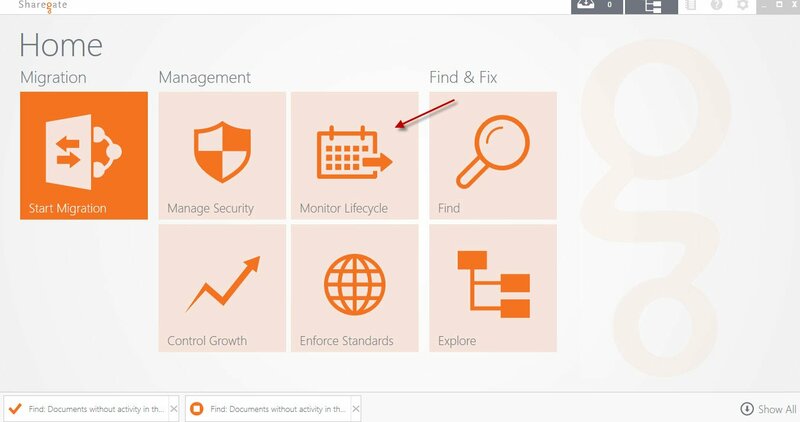 In fact, I think the first step in keeping your SharePoint clean and in accordance with your governance plan would be to monitor the lifecycle of your documents. To do so, we've got some pretty exciting features. Simply launch Sharegate and click on the "Monitor Lifecycle" tile. 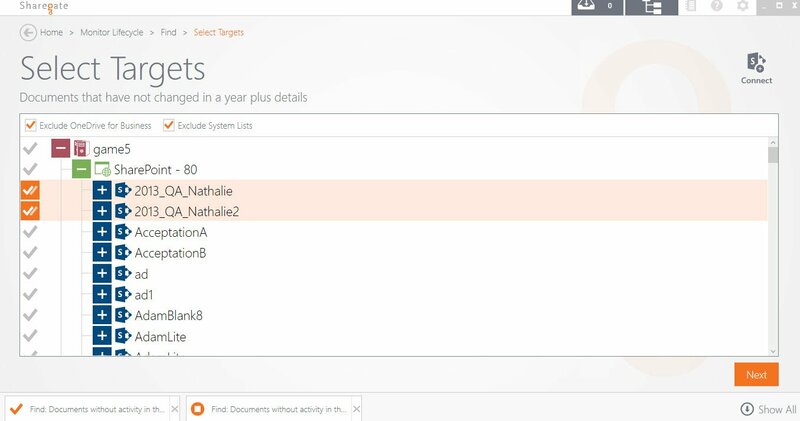 From here, we already provide you with some built-in reports you can work with. You can of course tweak them to better suit your needs. This is exactly what you'll learn to do in this article. From the "Monitor Lifecycle" tile, I've selected the "Documents without activity in the last 6 months" report. With Sharegate, it's pretty simple. From the "Documents without activity in the last 6 months" report, I've changed the conditions from "Last Modified Date older than 6 months ago" to "Last Modified older than 1 year(s) ago". Then, in the “Specify the columns you want to see in the results” section, I’ve simply added Name, File extension, last modified by, last modified date and location. Once I've entered my criteria, the next thing to do would be to select (or connect to) the environment where I want to find these old files. You can select the libraries, sites, site collections or the entire farm to run your query on. When you've got the right element, simply click “Next” and let Sharegate do all the work for you. send the report to relevant users. So you see, it's really simple with Sharegate to find anything you need in SharePoint or Office 365. You can run queries on a lot of elements in your environments to get more details in terms of what's going on with your farms. The beauty with the Sharegate approach, is that you can find elements that do not comply with your rules and send them to your end users. They can now take care of their documents on their own! You give them freedom all without losing control over your environments. I'm curious, are your users well organized, or do you have to clean up their content behind them?